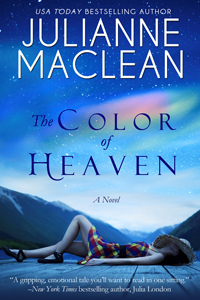 USA Today bestselling author Julianne MacLean begins her Color of Heaven Series with a fast-paced, emotionally gripping tale that will move and inspire you. "Just finished reading The Color of a Promise by Julianne MacLean. The best book I've read this year!" "'The Color of Heaven' is pure reading pleasure. MacLean's well-paced, fluid prose takes readers through the full expression of family and love. Family drama, the pain of loss, the hope of new beginnings, and falling deeply for the new man--it's all in focus in this women's fiction series."